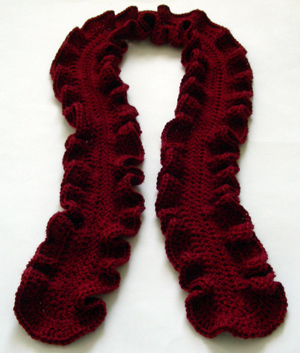 If you’re a ruffle lover, crochet this scarf to add to your collection! With ruffles on both ends, this scarf is bound to add some flavor to your outfit. This scarf is easy and quick to crochet, using lots of double crochet stitches. Need Help? No worries, just let me know if you need any help while crocheting your scarf and I’ll help you out! This entry was posted on Friday, December 3rd, 2010 at 12:00 AM by Rachel Choi	and is filed under Best Crochet Patterns. You can follow any responses to this entry through the RSS 2.0 feed. You can leave a response, or trackback from your own site. just purchased it, really excited to get started! wow, scarf is so pretty. LOVE this cute pattern. Easy to follow directions and worked up so beautifully.